For JetBlue's decommissioned uniforms, the sky is still the limit. New York's perky "hometown airline" has partnered with the bag-makers at Manhattan Portage to turn its leftover, never-before-worn flight gear into a collection of carryalls for style-setters and aviation buffs alike. "When we launched our new uniforms, it was important to us to keep the fabric from the old and unworn uniforms out of landfills by putting them to good use," says Sophia Mendelsohn, head of sustainability at JetBlue, in a statement. "JetBlue and Manhattan Portage are based in New York, so we both wanted to have a little fun and showcase our love for our hometown." Manhattan Portage says it kept JetBlue’s buoyant brand personality in mind when creating the bags. The dopp kit, for instance, comprises an exterior made from JetBlue’s windowpane flight-attendant shirts, a lining derived from its scarves, and a handle cobbled together from a necktie. The “Sohobo” bag was once an all-weather jacket. The “City Lights” bag is the reincarnation of a JetBlue pilot’s shirt, its wings meticulously preserved. 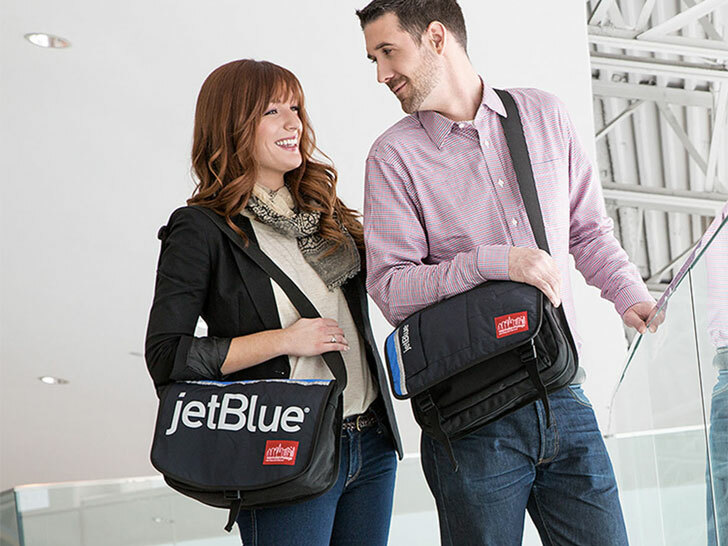 “By incorporating the technical aspects including high-visibility reflective prints of the JetBlue ground operations crew member uniform pieces and the aesthetics of the inflight crew uniform piece, such as the signature pilot wings, we were able to come up with a series of durable bags that are as fun and unique as JetBlue,” says Lauren Hoffman from Manhattan Portage’s sales and marketing department. This isn’t JetBlue’s first attempt at finding new homes for its old threads. The carrier, which redesigned its uniforms last June, previously donated more than 18.5 tons of used uniforms, clothing, and fabric to Planet Aid, a nonprofit that recycles unwanted garments to fund sustainable development in Africa, Asia, the Caribbean, and Latin America. The carrier, which redesigned its uniforms last June, previously donated more than 18.5 tons of used uniforms, clothing, and fabric to Planet Aid, a nonprofit that recycles unwanted garments to fund sustainable development in Africa, Asia, the Caribbean, and Latin America. Each bag not only diverts textiles from landfills, according to Mendelsohn, but it also represents a piece of airline history "once worn by some of the most unique crew members in the industry." Manhattan Portage says it kept JetBlue's buoyant brand personality in mind when creating the bags. "By incorporating the technical aspects including high-visibility reflective prints of the JetBlue ground operations crew member uniform pieces and the aesthetics of the inflight crew uniform piece, such as the signature pilot wings, we were able to come up with a series of durable bags that are as fun and unique as JetBlue," says Lauren Hoffman from Manhattan Portage's sales and marketing department. The dopp kit, for instance, comprises an exterior made from JetBlue's windowpane flight-attendant shirts, a lining derived from its scarves, and a handle cobbled together from a necktie. The "City Lights" bag is the reincarnation of a JetBlue pilot's shirt, its wings meticulously preserved.